Most people associate L'Isle-sur-la Sorgue with its Sunday market and its extensive antique, brocante, and vintage trade. The Sunday market (and to a lesser extent the Thursday market) brings the agricultural wealth of the region, as well as expanded antiques business. It's a wonderful place to experience the sights, sounds, and smells of Provence. If you're living in an apartment or house, it's also a great time to stock your kitchen with delicious produce, cheeses, charcuterie, olives and olive oil, and other essentials. During the week, L'Isle-sur-la-Sorgue is a quieter place, a more typical French town. As we've spent time in L'Isle-sur-la-Sorgue, we find it is less about "seeing" and "doing," and more about "experiencing." 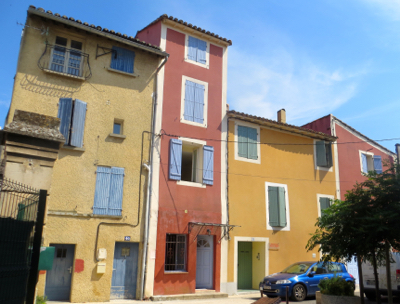 Colorful houses seen while walking around L'Isle-sur-la-Sorgue. The narrow streets are lined with shops that mostly serve the needs of the locals—a Tabac, several excellent boulangeries-patisseries, clothing and shoe stores, and more. Cafés and restaurants flourish along the quais and the Place de la Liberté, the heart of the town. The large Collégiale Notre-Dame-Des-Anges is also in the Place de la Liberté. 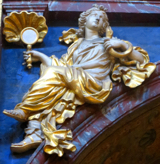 Its ornate gold decor from the 17th century is splendid. As you stroll through the town, you will stop to admire the fourteen remaining water wheels, each with a history and a story. 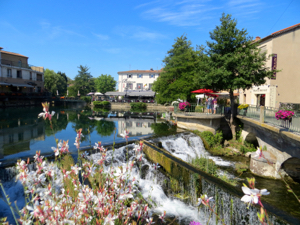 You can also walk or drive 2 kilometers (1 1/4 miles) to the partage des eaux, where the River Sorgue divides. And if you go about 8 kilometers (5 miles), you can see the source of the Sorgue at the Fontaine de Vaucluse. Art galleries are spread throughout the town. Most of the antique dealers are just across the bridges to the south and east of the town. 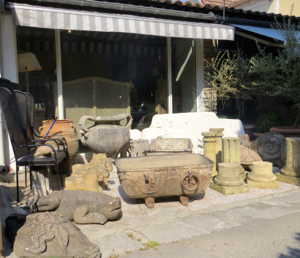 Referred to as "Les Villages et groupements d'Antiquaires," that's where you'll find the antiques and brocante that have made L'Isle-sur-la-Sorgue famous. Above, A variety of items for sale in an antique shop. Below, the River Sorgue with summer flowers.